I've been posting some of my PDF essays on Scribd.com for almost a year now and so far have recorded 25,400 reads. 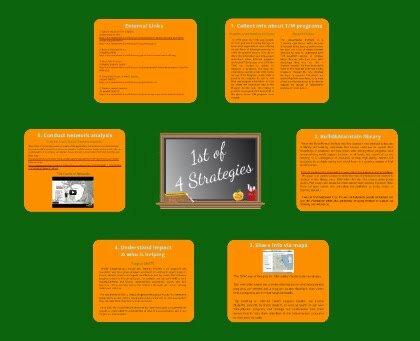 I started posting some of these on Slide Share too and I've just learned that I could embed the presentations in my blog. 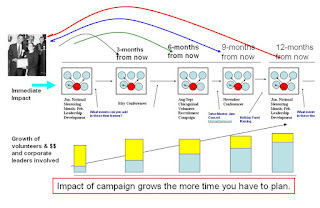 On Friday I posted one from SlideShare (see here) . This is from Scribd. 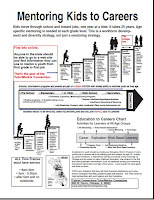 My aim is to share ideas and recruit talent, leaders and financial support from business, colleges, high schools and faith groups to help these ideas become part of the strategies leaders apply in many places to help kids in high poverty have an expanded network of adult support that helps them move through school and into work. Collecting, organizing, visualizing, sharing and helping people understand the information is critically important and cannot be done well with just a few people involved. I hope you'll look at these. Which platform do you prefer? Slideshare? Scribd? Is there another platform I should be using? 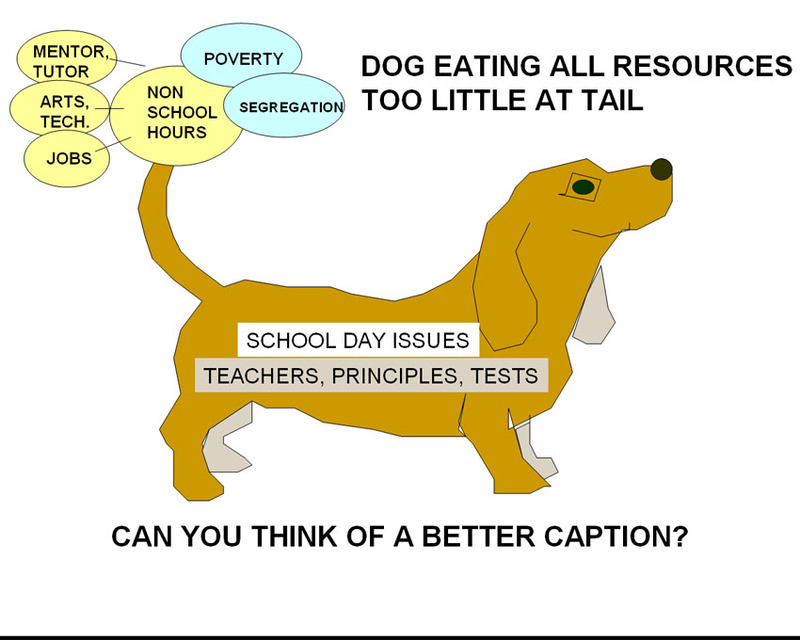 I've been creating graphical presentations for more than a dozen years to help people understand my ideas and find ways to adopt them into their own commitment to help kids in poverty neighborhoods, as well as their own kids. Here's one that I uploaded today to Slideshare. Dog Eating Too Much of Education Conversation? This week I've spent at least 10 hours listing to on-line discussions focused on helping more young people graduate with the preparation they need for college and to compete in a global marketplace. Saturday it was American Graduate. Monday and Tuesday it was the Education Nation Conference. I also listened to the Clinton Global Initiative. Last night I watched part of Education Nation on WTTW and today followed a live chat about the film. There were a number of profiles of youth serving organizations, but too little discussion of the leadership, marketing and resources needed to fill neighborhoods around poorly performing schools with mentor-rich learning programs. It led me to create this graphic. I think our public education conversation is monopolized by the education/business establishment and that a focus on poverty and strategies that fill the non-school hours with youth and family supports, including jobs, is just not getting enough attention. Do you agree? Can you think of a better caption for this graphic than what I've posted? Where are you meeting with people to build the leadership and support system needed to make high quality, constantly improving youth tutoring, mentoring, arts and technology programs available in your community? How do you evaluate the programs that are in your community? 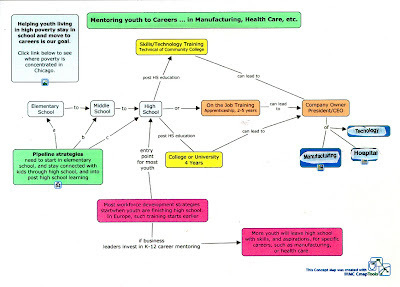 Do the web sites have graphics that show an intent to help youth through school and into jobs and careers? Most programs can't do everything, but do they show what role they take in this effort? Who will sponsor another track of on-line broadcasts where leaders are talking of what they are doing to support a city-wide network of youth serving organizations operating in non-school hours? This is the video from the September 13 SEA-Chicago event held at the Groupon headquarters in Chicago. I was given the opportunity to introduce the Chicago group to the Social Capital World Forum and Living Bridges group members who were participating via the live video feed and a Twitter chat. 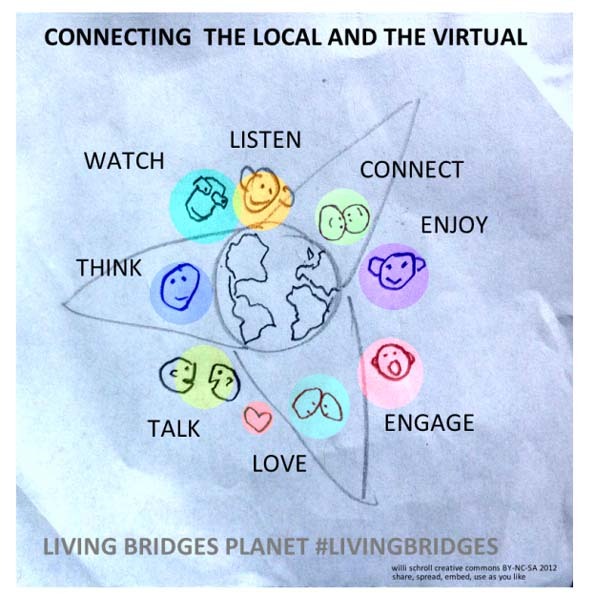 Here's a Living Bridges Planet article written in 2013 that describes this collaboration. My hope is that people and business leaders in Chicago who are concerned with the high costs of poverty and the needs of the workforce will sponsor my efforts to bring people together via conferences and on-line forums. The next conference will be November 19 in Chicago. Become a sponsor. Learn more. Or become a sponsor of the Tutor/Mentor Institute, LLC. See this article I wrote about "naming rights". I often comment on the SSIR articles, but sometimes chose to post my reflections in my own blog. I think faith communities have huge untapped potential to influence social change. They already have one of the most effective communications systems in existence and they have millions of people coming together each week to network and share ideas. Thus, I think it's only a matter of time before we see cable TV shows that look like the current Gospel hour shows, but when we tune in we find that these are planning sessions where the leaders are using maps to show all of the places within 5 or 10 miles of different congregations where members can become change agents by giving generously of their time, talent and dollars. In addition I've written a few dozen blog articles to show what strategies faith leaders might adopt to help kids living in inner city poverty gain an expanded network of adult supporters who help them move from first grade to their first job. 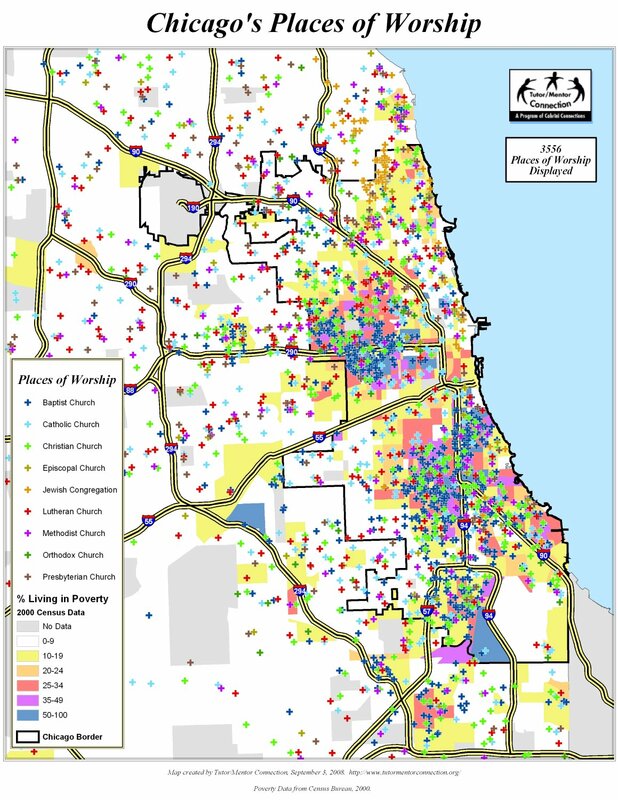 In these I use maps to show not only poverty, but locations of different faith groups in the Chicago region. Faith leaders could survey their congregations and determine the current level of involvement each location has in supporting youth through tutor/mentor programs. They could create their own maps showing their current level of influence in the region then set goals to expand their influence from year to year. They could even use these to build collaborations with other faith groups and influence what private sector and elected people do. Most religious organizations have a calendar of holidays, Holy Days, messages that are delivered each year at the same time. I created this graphic in the past to show how faith leaders might use the same 52-week calendar to encourage congregations to become involved with the information I share about where and why tutor/mentor programs are needed, and as volunteers, leaders and donors, supporting the growth of one or many tutor/mentor programs in Chicago and other cities. As a growing number of faith leaders integrate this thinking into their own actions we'll be able to build greater attention for the issues facing youth, families and congregations in high poverty, and more connections between those who were blessed to be born in more affluent circumstances with those who were born in areas where greater challenges exist. 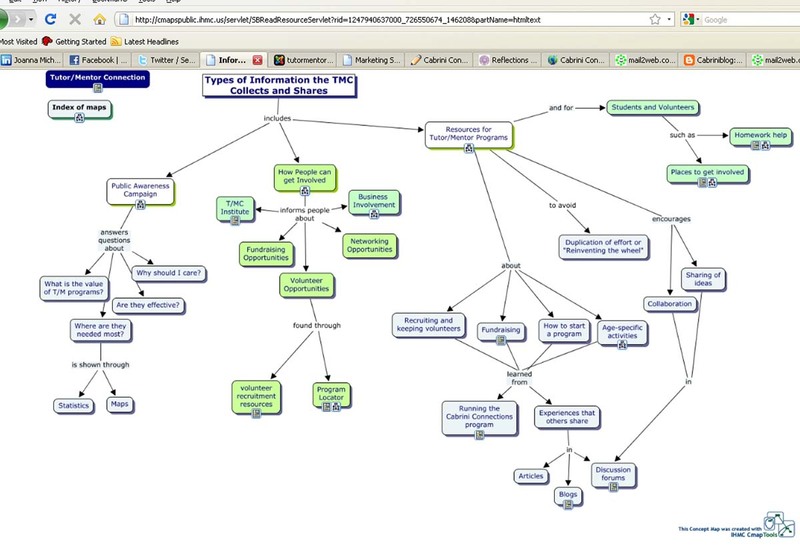 If you know of religious groups using maps, sermons, TV shows, web sites, etc. to connect congregations with poverty in their regions share links and stories about them on your own web sites and evangelize these examples throughout the faith community so that good ideas are adopted in more places. Who better to take this role than faith communities who are more accountable than most of us to a higher power. 9-14-2018 update. Since writing this article I've found other resources that can be used to map faith groups. One is the Association of Religion Data Archives, ARDA. A second resource is the Community Commons web site, which I point to in this blog article. While the My Hero Awards event is nine years old, the Lend A Hand Program started organizing events to raise awareness and dollars to fund volunteer-based tutoring and/or mentoring programs in Chicago starting in 1994. 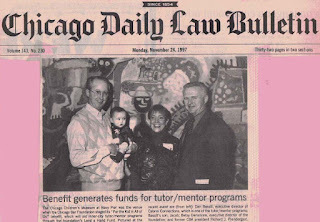 The photo above shows myself with my son Jacob, Betsey Densmore, Executive Directory of the Chicago Bar Foundation, and Chicago Bar Association President Richard J. Prendergast at a 1997 event held at the Chicago Children's Museum. In today's event Dan Cotter, current Chair of the Board for Lawyers Lend A Hand, presented a check for $45,000 which he had personally raised through a "Lifting to Lend-A-Hand" campaign. Dan personally has raised more than $250,000 to support the Lend-A-Hand efforts since 2002. Imagine if hundreds of lawyers and other professionals were making the same commitment to support volunteer-based tutor/mentor programs in Chicago. This year's Law Firm Partnership of the Year Award went to Freeborn & Peters LLP who has provide long-term support to Chicago Scholars. At the conclusion to the event Genita Robinson, Executive Directory for Lawyers Lend-A-Hand said "If every mentor program in Chicago had a partner like Freeborn & Peters, LLP, what a difference it would make." I'd like to see that vision extend to every industry in Chicago, not just every law firm. No single donor funds more than a small percent of the full operating costs of any tutor/mentor program. Thus dollars need to come from multiple sources, not just from one or two. At the same time, one of the greatest benefits of a tutor/mentor program is that it connects young people to adults and experiences beyond the poverty neighborhood where they live. If tutor/mentor programs had volunteers coming from many different industries and professions each program would offer a wider diversity of experiences and mentoring to their students. This could happen if every person who attended today's lunch were to read this article and make an effort to encourage people he/she knows to get involved. It could happen if the volunteers in every program funded by Lend A Hand were to actively encourage their companies, faith groups, college friends and families to devote part of their giving pie to support volunteer-based tutor/mentor programs in different parts of Chicago. Merri Dee was MC for today's lunch. 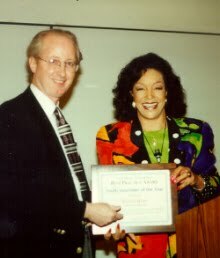 I first met her in 1990 as I was creating the Cabrini-Green Tutoring Program, Inc. I've always been inspired by her "If it is to be, it is up to me" statement. If we want to help reduce poverty and violence and improve the quality of Chicago's workforce, it is up to every one of us to try to build the resources and talent flow that is needed in programs throughout the city and suburbs. I want to do better but don't have time to learn how. This video featuring Sir Ken Robinson is one of several from the 2012 International Society for Technology in Education (ISTE) conference that you can find on YouTube. Below the video I've highlighted some quotes from the video and provided some comments. In the first section of the video Robinson pointed out two challenges that I think are relevant to everything I've been writing about on this blog. 1) "Practitioners don't have time for theory" - To me he's saying 'The people in the classroom, or leading tutor/mentor programs, don't have time to view all of the videos, read all the blogs, or read all the research this is being produced.' This is a critical issue. Learning should be focusing on adults who need more about social problems and solutions, not just kids going from first grade through traditional education systems. 2) "Policy makers don't know much about theory or practice"...This is even more important. The people who are making policy decisions at the government level, or who make funding decisions at the corporate or foundation level are focused on short term issues and are often too busy to spend time learning from all of the information available to them. How do we engage them in learning from all of the information that is being shared? 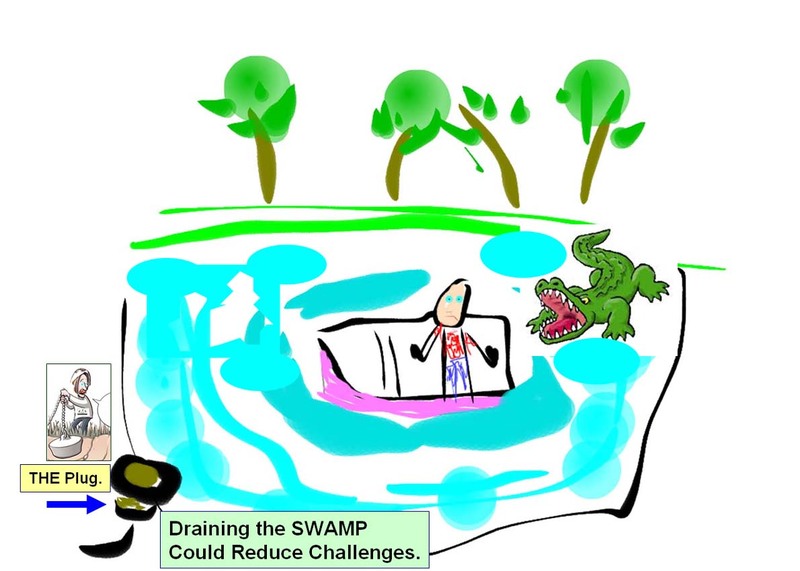 I wrote an article a few weeks ago showing how it's hard to get non profit leaders to collaborate on fixing some of the problems they face because they are too busy fighting for day-to-day survival and success in their work. I hope that my articles stimulate thinking among others so we can innovate ways to engage more people in learning from each other and from on-line information. Robinson also said in this video "No Social Change is Linear. It is unpredictable and dynamic." 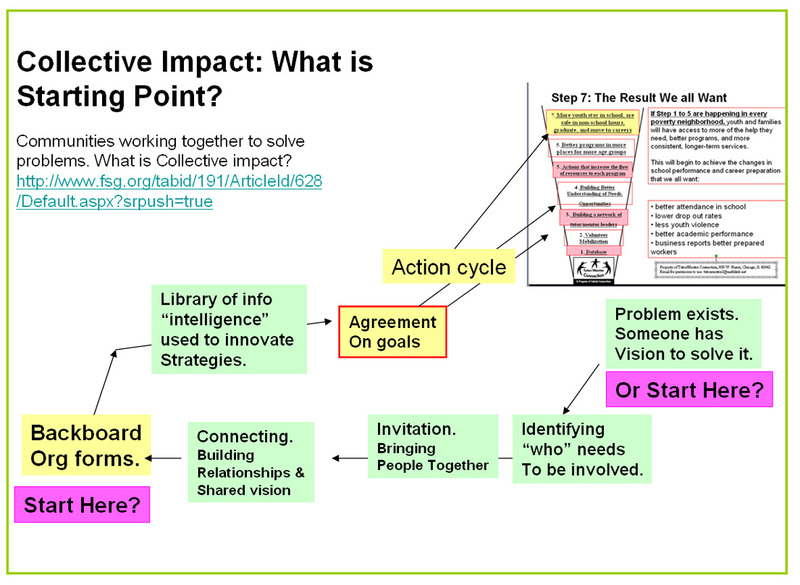 This article about Evaluating Social Innovation is one of many I've posted in the Tutor/Mentor Connection library that shows challenges non profits face. I feel that if we can engage volunteers, donors, policy makers, practice leaders, etc. in on-going on-line learning and relationship building we can create shared understanding of the goals of innovative projects before we begin to frame strategies to achieve them. My leadership of tutor/mentor programs intended to engage volunteers as leaders so they would give more of their own time, talent and dollars to help do the day-to-day work because they had a personal understanding of where we were headed and how well we were doing in getting there. Robinson recommended that we "Engage in the flow of knowledge" and stated "We learn from collaboration". 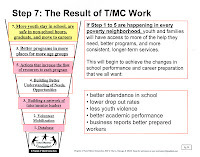 I've focused on site-based volunteer-rich non-school programs because they connect adults from beyond poverty -- and from the workplace -- with youth and families living in high poverty neighborhoods in an on-going learning process. Robinson talked about the "economic purpose of education". 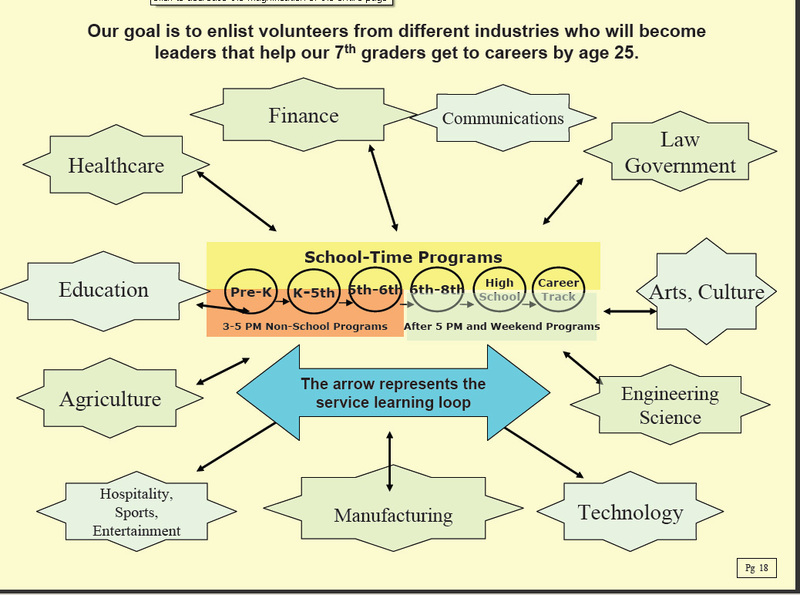 If business leaders see a strategic value in supporting employee involvement and use of company resources to make constantly improving tutor/mentor programs available in more places, we would begin to see programs in more places with talented staff who keep volunteers and youth involved for multiple years, and support learning by both youth and volunteers. Such programs could support a constant increase in the resources available and the number of people involved. This animation by one of my interns illustrates how supporting the volunteer's growth can make a difference. I've written a number of articles focused on learning. I think that we won't solve our K-12 education problems until we build an adult-learning support system where adults become personally engaged in service projects and through that are engaged in learning more about why the service is needed and ways they and other adults need to be more consistent in providing the resources to support the places where adults and kids connect. Those places can be schools operating from 8am to 3:30pm, or non school programs operating right after school or in the evening or weekend hours. Robinson said "There is everything you can do." I agree. We all have a role to play in creating social change and making mentor-rich programs available in high poverty neighborhoods of Chicago and other cities. I hope you have found time to read this far and hope you'll share this with others. On Thursday evening I was a participant in a SEA-Chicago event held at the Groupon headquarters in Chicago. More than 125 people attended. 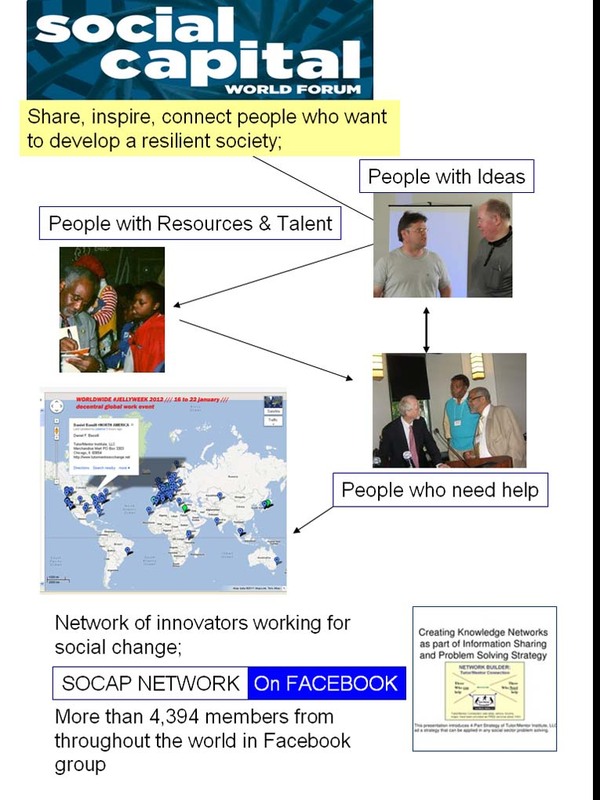 My role was to introduce this group to the Social Capital World Forum2012 and a network of social innovators from around the world who were participating via a live feed and a Twitter chat. I've been connecting daily, sharing ideas and learning from this extraordinary group of people via several Facebook groups for more than a year. I've hosted a Tutor/Mentor Leadership and Networking Conference in Chicago every six months since May 1994. The goal is to bring people together to talk about the different ideas I have been sharing on this blog and the Tutor/Mentor Institute, LLC web site for many years. I'm now organizing workshops and panel discussions. This link shows topics that have been requested by people attending past conferences. If you'd like to volunteer to host a workshop please fill out the presenter form as soon as possible. Can you write about tutoring/mentoring or Tweet during the November Conference so that more people support tutor/mentor programs in December. I've been trying to do this since 2006 when I first shared this idea here. Is the CPS strike addressing the US Skills Gap? This info graphic is one parents and k-12 youth should be looking at. Policy makers should be asking schools what they are doing to motivate more young people to choose technical careers. Businesses should be building strategies that engage current workers as mentors who influence career choices of future workers. Look a these Leadership Ideas and build your employee engagement strategy to support your workforce development goals. The Chicago Public School school strike started yesterday. During a Sunday evening press conference I heard the head of Chicago Board of Education say how proud he was that faith groups, non profits and others in Chicago are rallying to provide safe places for kids to go during the school day. As a crisis response, this if great. However, it does not address the long-term issues of helping young people overcome high poverty and move through school into 21st century jobs. So I’m not writing about the strike. I want to cut through the clutter and keep attention focused on the bigger picture. I have a suggestion if anyone cares to listen. Since starting this blog in 2005 I’ve posted a growing number of stories showing acts of violence, acts of violent nature and acts of overwhelming greed and self-interest. Prior to that I posted such information in a printed newsletter that I was sending to as many as 12,000 people between 1997 and 2001. Then I ran out of money to keep doing that. 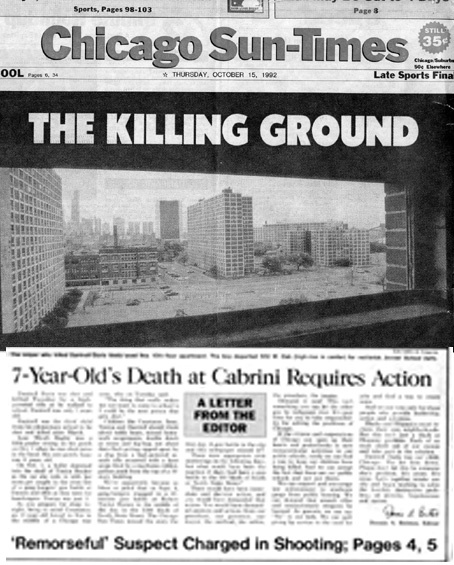 This is the front page from the Chicago SunTimes of October 15, 1992 following the shooting of 7 year old Dantrel Davis in Cabrini Green. This was two years prior to the killing of ‘Yummy”. As I read about senseless shootings I find it hard to shout out “Be a tutor/mentor!” It can stop this violence!” I find it difficult to say “this is the solution”. I feel my response is inadequate to the magnitude of the problem. Someone who has grown so cold-hearted that he/she can point a gun at another person and pump dozens of bullets into a body has far too many problems for a volunteer mentor to overcome by taking him/her to a movie or a library a few times. 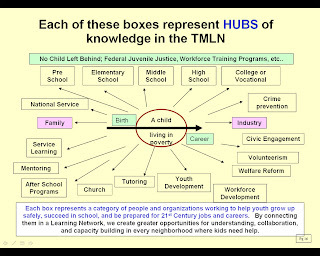 Yet, had Chicago’s civic, political, philanthropic and political leaders provided the leadership and funding I’ve asked for every year since 1995 when I sent this Chicago Tutor/Mentor Program Directory to many of them, perhaps the Program Locator map that is now on my web site would show more “world class” programs in high poverty neighborhoods where kids could be connected with people, ideas and facilities that were inspiring them to learn and make the most of their lives. If Mayor Daley and Mrs. Daley had provided their support to growing the Tutor/Mentor Connection with a fraction of the effort given to supporting Afterschool Matters perhaps we’d have a city full of high quality, mentor-rich non-school programs rather and many neighborhoods with high poverty and too few programs. Maybe we'd have better tools to collect and share this information, draw people together, and draw needed funding to ALL of the youth tutoring, mentoring, arts, learing and technology programs in the city. Or perhaps if the Montgomery Ward Corporation had not gone into bankruptcy during the 1990s and out of business in 1999, we’d would have maintained the support of executives like Bernie Brennan, and had the civic reach needed to build philanthropic capital needed to support the vision shared in this blog and on the Tutor/Mentor Institute, LLC web site. 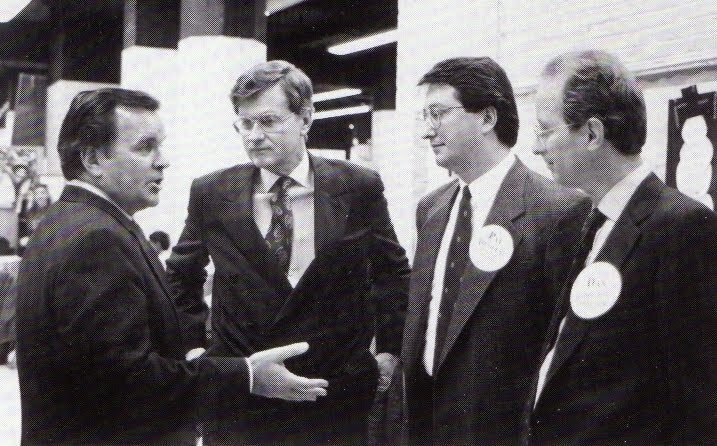 This picture is from a 1990 visit by Mayor Daley to the Montgomery Ward Chicago Headquarters where I was leading a volunteer-based tutor/mentor program that was started by Ward’s employees in 1965. Last night at the Chicago Public Library I heard Paul Tough and Alex Kotlowitz talk about their own experiences researching stories of young people living in high poverty neighborhoods. Tough’s new book, titled "How Children Succeed", suggest that teaching “character, grit and resilience” is a way to help young people be better prepared to overcome challenges in life. In the book he profiles the Youth Advocate Mentoring Program launched by CPS CEO Ron Huberman a few years ago. He also profiles a new effort called One Goal, that is supporting youth as the move from their Junior year in high school through the first year in college. I’ve tried reaching out to media, sports stars, faith leaders, and many others over the past 20 years because I see part of our problem to be one of marketing and communications. Too few people will read the books by Kotlowitz and Tough. Too few people will view the video by Pastor Gordon. Too few people will read my blog articles or look at the maps and other information shared on my web sites. Too few people will become personally involved in building mentor-rich support systems in high poverty neighborhoods and then growing those into more extensive community development efforts such as Pastor Gordon has done in Lawndale and Bill Strickland has done in Pittsburgh. 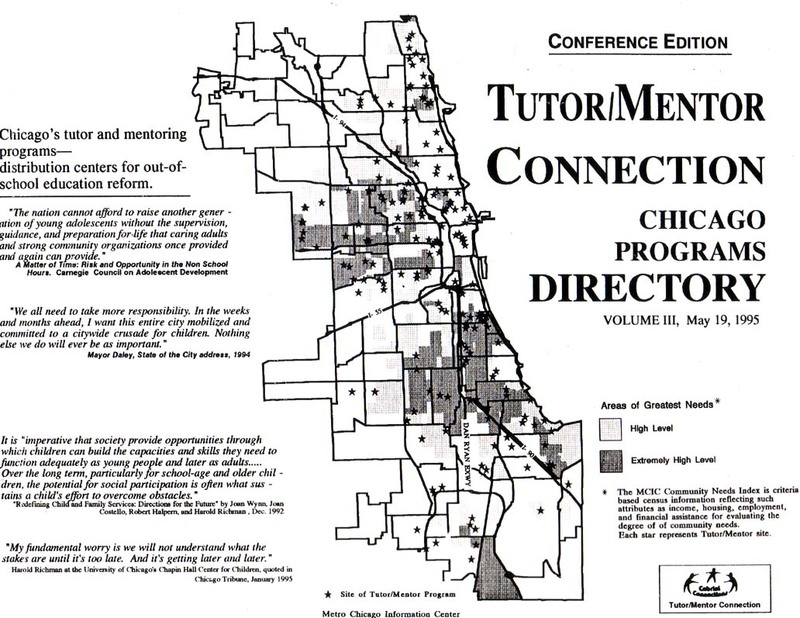 One of the reasons I started the Tutor/Mentor Connection in 1993 was that no one had a master database of Chicago tutor/mentor programs and no one was trying to understand how they differ from each other. 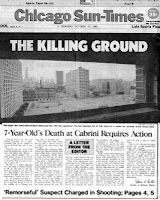 When media were giving attention to tragedies, such as after the 1992 killing of Dantrel Davis in Cabrini Green, they were only pointing to a few of the well known youth programs in Chicago. From my work in retail advertising with the Montgomery Ward company I knew that our weekly advertising was intended to draw customers to all 400 of our stores, not just to one or two high profile locations. I created the Directory and the Tutor/Mentor Connection Library so that when people write books and news columnist write stories they could point people to the Directory and a common base of information and say “use this to determine where your neighbor lives and where you want to give your time, talent, dollars and/or technology to help kids move through school and into jobs”. While I'm sure One Goal is a great program, so are HighSight, Chicago Tutoring, Youth Guidance, UCan and dozens of other youth organizations working in different Chicago neighborhoods. They all need constant attention and support in order to retain talent, learn from each other, and constantly improve. I have a clip file of dozens of editorials and newspaper columns written since 1990. I link to hundreds of blogs, research papers and other reports where people who are far more talented than I are sharing their ideas. My goal is that some of these writers look at my blogs and pdf essays and rewrite them using their own talents, but with a shared purpose of increasing the number of people who become involved and stay involved in this effort to help kids who need extra help for a long time. Once you’ve had your passion stirred, look at some of the leadership ideas I’ve posted in this section of the Tutor/Mentor Institute, LLC. Look at the essay’s I’ve posted on Scrib.com. Form a learning circle within your faith group, alumni network, business, etc. and begin to use the maps and other resources in the Tutor/Mentor Library to determine who your neighbor is and what you can do to help them. Look at these graphics. What do they mean to you? Can you do an new version that communicates this idea better? Try it! To me this says if leaders keep pointing to tutor/mentor program directories and databases when they talk about education and poverty they can help build public attention and increase the flow of private sector volunteers and dollars to programs in all parts of the city, not just the high profile programs or neighborhoods. 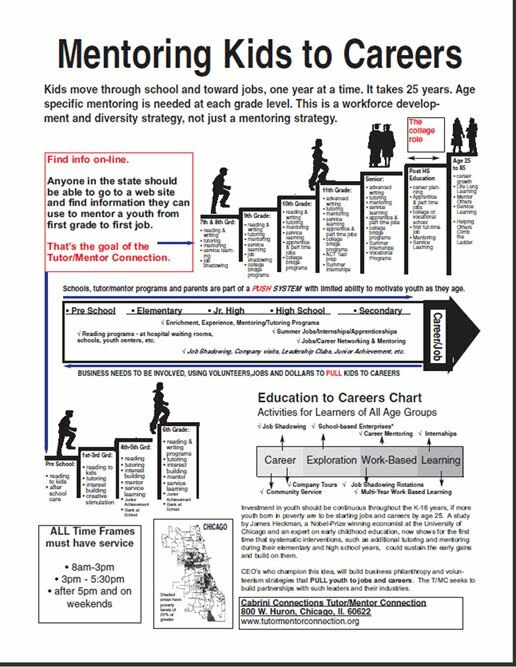 If leaders from many sectors adopt these ideas and apply consistent support to the growth of non-school and internet based learning centers throughout the high poverty areas of the Chicago region, or any other urban area of the country, there can be a growth of resources, a better distribution of resources and talent, and a growth of high quality tutor/mentor programs in more place. 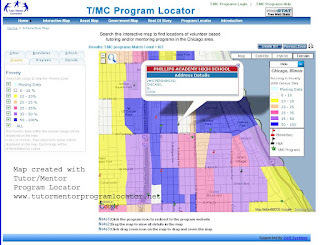 In 20 years the map of programs will show far better distribution of programs in places where they are needed and the websites of programs will show more stories of young people who have moved through school with the help of extra adults and non-school programs that were available in their neighborhood. Do you want to discuss this further? Are you already doing this? Contact me. Connect on Facebook, Twitter, Linked in or the Tutor/Mentor Connection forum. Expanding social capital. Library as network. This Thursday, September 13, I’m participating in an event at the Groupon Headquarters in Chicago organized by the Social Enterprise Alliance – Chicago Chapter(SEA/Chicago). This event will connect social entrepreneurs in Chicago with others from around the world by linking live with the Social Capital World Forum 2012. I’ve written many articles in the past talking about strategies that connect people from different organizations, different places, and different ideas with myself and each other. My participation in this Thursday’s event is just one more part of this on-going network building. So, you might ask, who are you trying to connect? 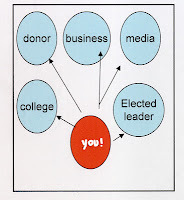 In the Introduction page on the Tutor/Mentor Connection web site I show that there are a wide range of potential users of the information on the web site. 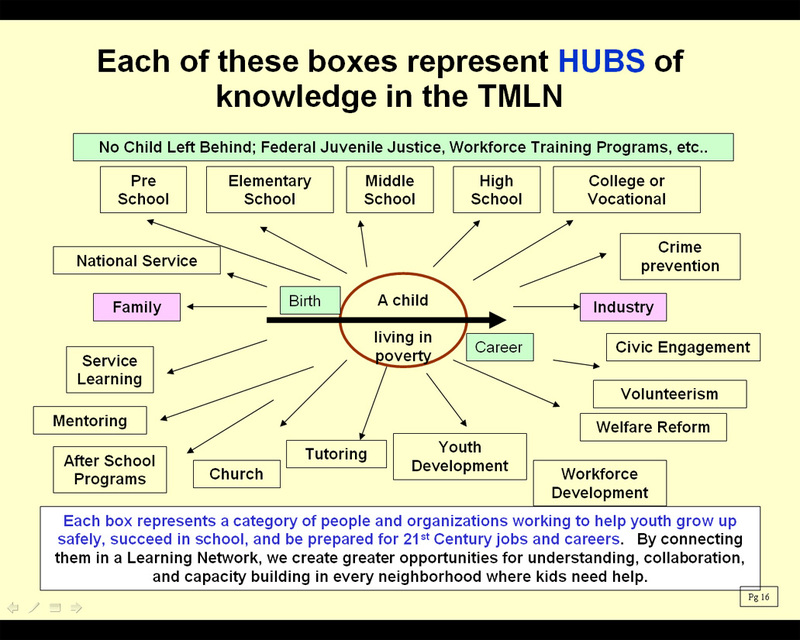 This graphic illustrates an intent to connect “people who can help” with “places where people need help”. 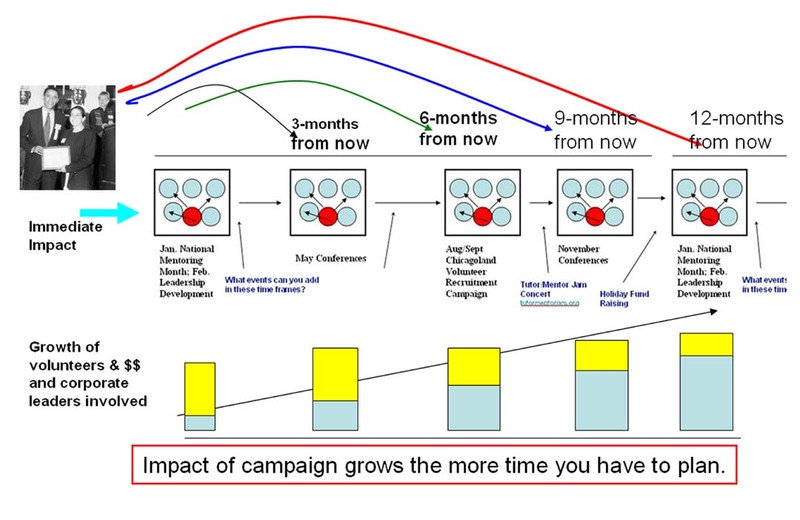 This is one of many graphics I've created to illustrate this. I attend conferences and meetings all the time. Last Thursday I attended the 25th Anniversary of the Lawndale Christian Development Corporation as the guest of Brian Banks. I heard Bill Strckland, president-CEO of Manchester Bidwell Corporation, talk about making the impossible possible. I met “coach” Wayne L. Gordon, Head Pastor of Lawndale Christian Church, and the founder of LCDC. Who is My Neighbor? 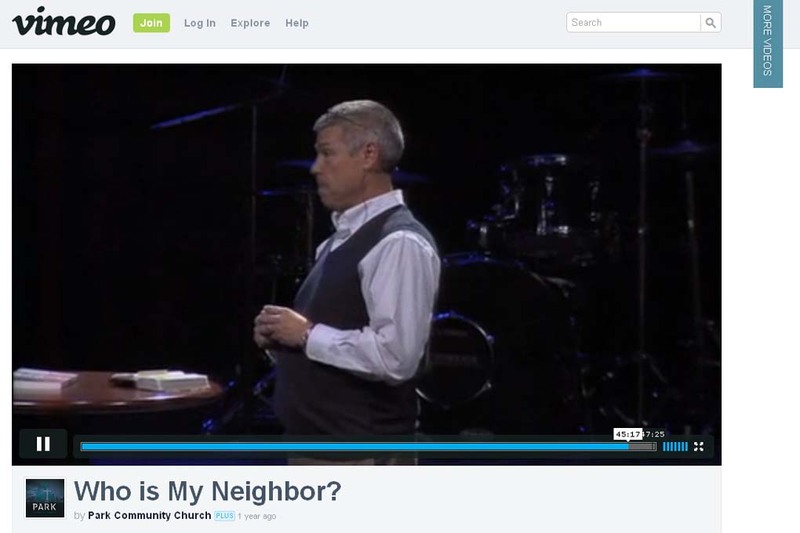 from Park Community Church on Vimeo. I point to people like these in my library because they are inspirational leaders who have built institutions for community change over many years of persistent effort, overcoming many obstacles in the process. I don't yet know these people. Attending an event does not build a relationship I was just one person in the crowd. I may have visited their web sites, and added them to the Tutor/Mentor Connection library. That does not mean they responded by visiting the T/MC web site. Thus, the question I focus on is "How do we connect in on-going informal relationship building, idea sharing, and brainstorming" that might lead to partnerships and collective actions? When I attend the SEA/Chicago event on Thursday I’ve been asked to introduce the World Social Capital Forum because I’ve been in conversation with some of its leaders on Facebook for nearly a year. We’ve been forming relationships and sharing information. I’ve been adding new ideas to my library, such as this collection of articles. Have you ever considered a “library” to be a network? Think of it. There are thousands of books organized by category in every public and college library. Each is full of ideas. Each was written by someone who spent extensive time researching these ideas. On Monday I’m attending an event at the Chicago Public Library where I’ll listen to Paul Tough and Alex Kotlowitz. These would be two authors found in any library. They both are represented among the 2000 links I host in the Tutor/Mentor Connection Library. 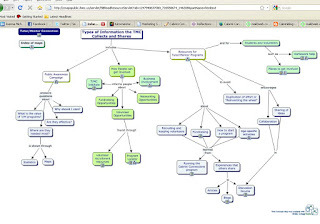 The map below is one way of showing information we collect and share. 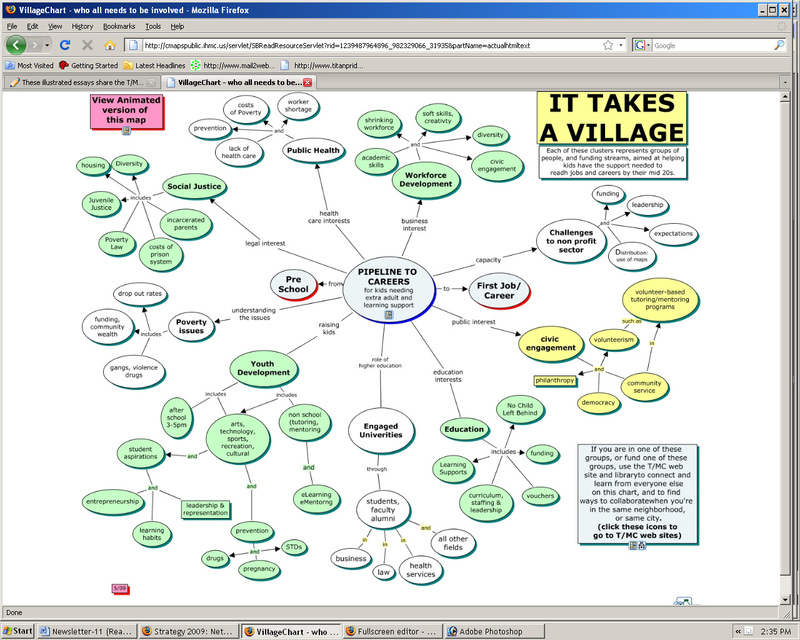 If you follow the links in this concept map you go on a journey that constantly can expand the ideas and people who might help you in your own efforts. The difference from a public library and the T/MC library is that the public library has information on a broad range of topics, but does not have anyone trying to mobilize people around any segment of that information in order to improve social problem solving. If you review the Tutor/Mentor Connection's four-part strategy, the information is just one part of an organizing and problem solving process aimed at helping build volunteer-based tutoring, mentoring and learning programs that help kids through school and into jobs and careers. I encourage you to read some of the articles on social capital and knowledge management that I’ve collected. These talk of expanding networks and show tools for analyzing social networks so you can use them more effectively. Getting the people associated with each of the links in the library connected and talking to each other, in Internet space where others can also participate, is a goal I think many of us share. It would expand the social capital and knowledge for everyone participating the network. So, what would it take to draw representatives from each of these links into Facebook, Linked in or other forums where we talk together, share ideas, and look for ways to work collectively to solve problems? I hope that the events I attend this week will result in new connections for everyone who participates. 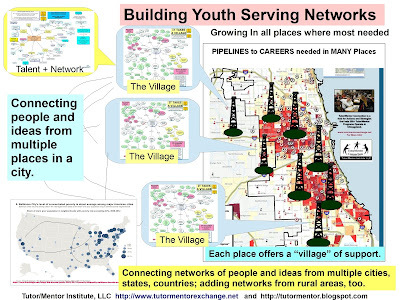 I hope they also result in a few new connections that help me build and sustain the Tutor/Mentor Institute, LLC problem solving platform and network of support for youth in high poverty areas of Chicago. A while back I wrote this article and included a link to a paper titled the Cyclical Process of Action Research. I found this video on my Linkedin site today. To me this is a form of Total Quality Management (TQM) that I learned when I was working at Montgomery Ward in the 1970s. If we can learn from what we do, what our customers tell us and what our competitors do we can apply what we learn in constant process improvement. That works well when you have the resources to do the research, facilitate the learning, and invest in the suggested process improvements. I'd like to find someone who would do videos like this focusing on the challenges non profits face in attracting consistent, flexible operating revenue and a wide range of talent needed to build quality organizations. If we can get more people into this discussion perhaps we can do much more to help high quality programs reach young people in more of the poverty areas of Chicago and other cities. I've been looking for volunteers, partners and/or sponsors/benefactors to help me apply this thinking in the work of the Tutor/Mentor Connection and Tutor/Mentor Institute, LLC for many years. 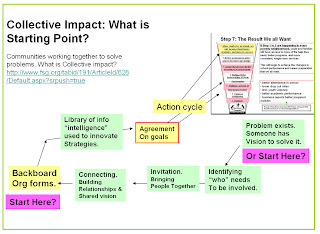 Collective Impact - What Leads Up to this? In the August 31 Huffington Post Emmett D. Carson, CEO, Silicon Valley Community Foundation offers a critique of Collective Impact. In the September 5 FSG blog Emily Gorin Malenfant offers a response. I've written a number of articles focusing on collaboration and collective impact and I've posted comments on FSG blogs in the past. In the FSG response Ms. Malenfant writes that it is essential that "nonprofit organizations, funders, businesses and government agencies actively work together from a common base of facts and a shared set of goals." In my comments on FSG blogs I've asked for more information showing how these different stakeholders were brought together to the point where they had trust in each other and shared a common vision. This is a form of community organizing that is extremely difficult, but perhaps made easier if the person/organization doing the convening were also someone with a bucket of gold. My faith in the Internet is that anyone, regardless of your status, wealth, etc. could post a good idea and reach out through free media to build a following. However, I recognize how difficult this is. I encourage you to read both of the commentaries and more of the articles about collective impact. I don't think we can help millions of kids living in high poverty move through school and into jobs without a lot of people sharing the same vision and a long-term commitment to making this result a reality. 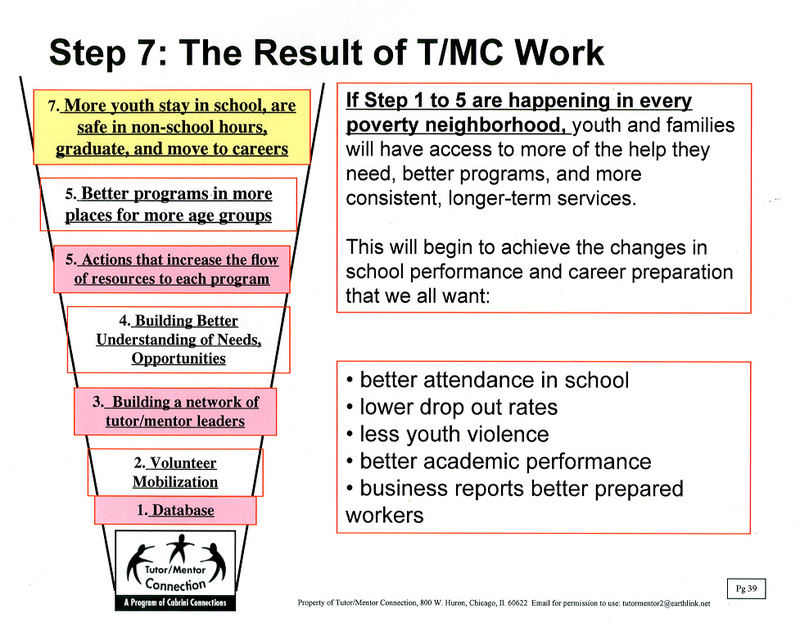 I learned more than 30 years ago that one person could not provide all the information that 100 volunteers who grew up in neighborhoods outside of Chicago's Cabrini-Green area needed to know to understand the challenges kids living in such neighborhoods face nor all that they needed to know to become effective tutors/mentors. At least not in the traditional teacher-to-learner role. Thus, I began to try to create a learning community, where volunteer, students, parents and other stakeholders would spend their own time reading, reflecting and learning from information I was collecting and sharing with them on a weekly basis. To understand what I mean by a "learning community" read some of the blog articles I share in this link. This was in the mid 1970s, far earlier than when I began to learn about the power of the Internet. 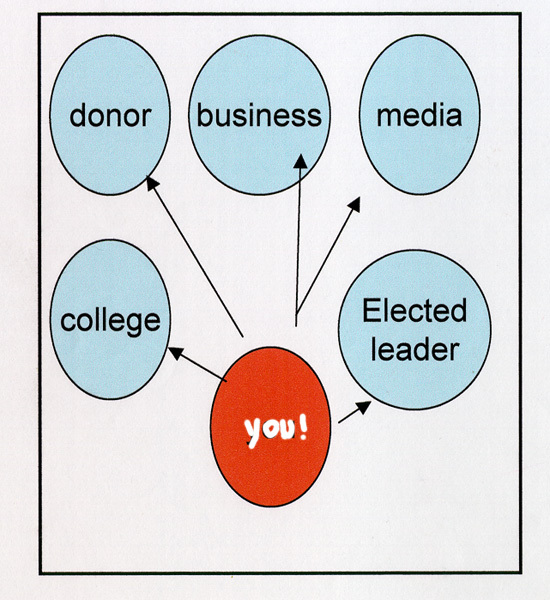 For the past 30 years I've attempted to engage volunteers, board members, donors, youth, etc. in the Chicago tutor/mentor programs I've led in an on-going learning process. 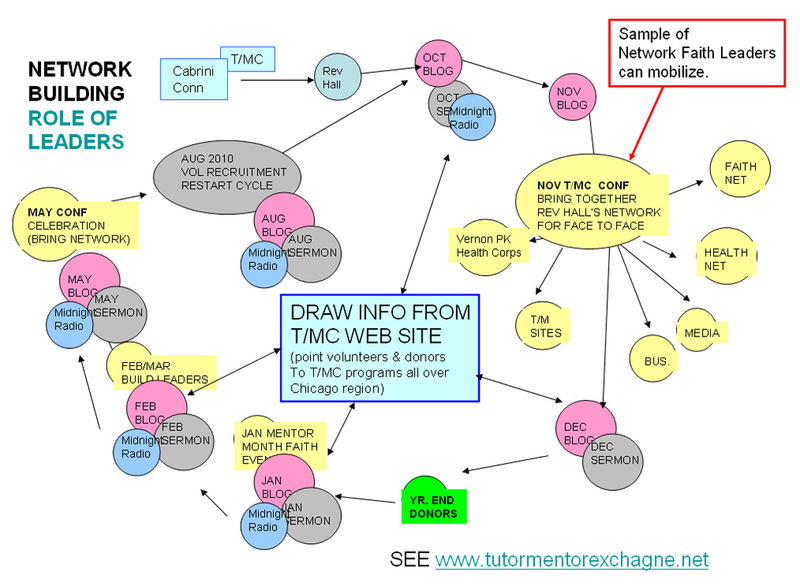 The information I now share on the Tutor/Mentor Institute, LLC site, this blog and other web sites I host all originated from my efforts to support the youth and volunteers who were meeting weekly at a small tutor/mentor program in Chicago. What I've learned from this process is how difficult it is to engage busy volunteers and under-motivated young people in this effort. Thus, I'm constantly spending time in my own learning, looking for experts who seem to have mastered this process better than I. On Sunday I spent an hour in an on-line forum with Vance Stevens who is an ESL educator based in Abu Dhabi. I've gotten to know Vance since we were first connected back in 2004. In Sunday's presentation Vance showed a process of student engagement that I think could be duplicated in schools, non-school organizations, faith groups,etc. in many places. You can view the slides and the presentation here. I'm writing as the Democratic Presidential Convention is taking place. During last week's Republican Convention and again this week as the Democrats meet, there will be all sorts of claims made that fact-checkers will be testing to determine how far the truth has been stretched. In reading some of the commentary about the campaign fact-distortion one of the fears I sense is that too few people will actually care enough to go to the fact-checking sites to see what is being posted and too few will spend time learning about the issues and building their own personal involvement in providing solutions that government really can't provide very well, not matter how much money is spent. That brings me back to tutoring/mentoring. 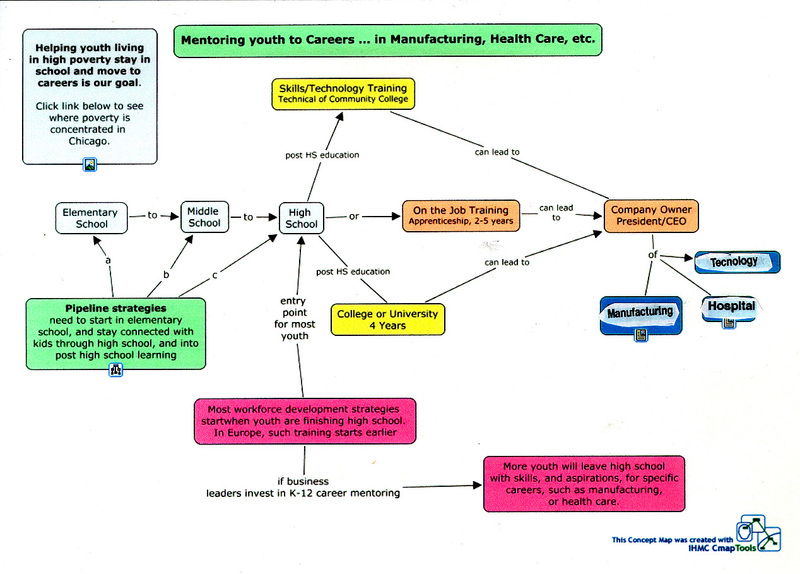 Below is a map created using the Tutor/Mentor Program Locator that I launched in 2008. It's intended to support leaders from business, religion, education, politics who want to reduce violence by helping young people have more positive learning, mentoring and job development opportunities during the non-school hours and through the public schools in the neighborhood. 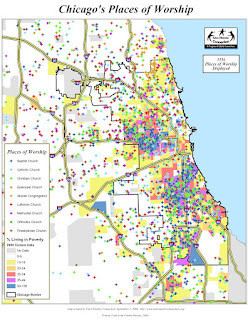 This map is of little use if no one looks at it, or if no one spends time reading other articles I've posted, and in reflecting, discussing, then building strategies that support existing programs already in this neighborhood while creating new ones where they are needed. I wrote about this same neighborhood in 2010 - see article. Here's the test. Are you still reading? 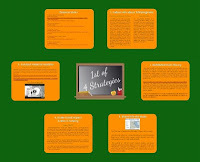 Did you visit Vance Stephens' site and review his presentation. If so, you are an active learner. We need more people taking this role, including young people. Here's a PDF I created showing how young people could be involved in community information collection. Here's one showing how they can become journalists, telling stories the media do not tell. Here's one showing how young people can be leaders drawing people together to look at this information. This presentation (click here) was done in just a few days by an intern from Illinois Institute of Technology, who is a college student from Korea. Are you still following me? Volunteers, educators and/or staff in youth programs could be applying the concepts Vance Stevens has shared to teach young people in many neighborhoods to do research, reflect on what they read, then communicate their ideas in many formats. Read some of the articles about knowledge management, creativity and innovation posted at this link. If this type of engaged learning becomes part of the on-going curriculum in many schools and non-school programs, we can grow a generation of young people who are more motivated to be active learners and who will use this process to engage others in community problem solving. Visit the Chicago Program Links library and browse the list of youth organizations in the region. Find one that is convenient for you to join and reach out to offer your time and talent to organize a learning process like this. As volunteers teach young people to engage in on-going learning they are also teaching themselves. That's the best thing about being a volunteer in a tutor/mentor program. Your life can be transformed as you work to transform the life of a young person. If you don't have anyone collecting and sharing ideas like this in your own community I'd be happy to help you. You don't need to start from scratch. Most of the information that I share can already be applied to your own circumstances. There's a great article in the sports section of today's Chicago Tribune talking about Digger Phelps' involvement in a mentoring program in South Bend. 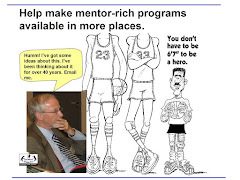 Looks like the famous Notre Dame former basketball coach is trying to recruit 500 new mentors. I think it's great that this story was given so much space in the sports section. I think it's great that the Coach is doing what he's doing. Unfortunately, I have not yet been able to find a link to the article on the Tribune web site. I just wish there were a consistent effort of coaches all over the country to not only recruit volunteers to tutor/mentor, but to build the infrastructure and team of community leaders needed to support mentor involvement in the lives of youth for multiple years and in all the places such programs are needed. I've posted articles showing roles athletes could be taking. I've pointed to sports concept articles written between 2008 and 2011 while I was President of Cabrini Connections, showing how a tutor/mentor program is like a sports team. The team on the field is only as good as the infrastructure supporting the team. In this wiki page I further describe this coaching strategy. Here's a video created by one of my interns to communicate this concept. I hope writers will keep drawing attention to coaches and athletes who are directly involved with youth. However, I also hope they will begin to point to the coaching and team building that needs to be done so great tutor/mentor teams are operating in thousands of neighborhoods throughout the country. Imagine what types of videos might be created if high profile coaches and athletes were creating them instead of college interns with only two or three weeks of time to work on the project? Perhaps in a future Olympics or Super Bowl coaches could be given recognition for this work? In yesterday's Chicago SunTimes Neil Steinberg wrote a column under the headline "The whole world is watching -- even if we aren't." His point was that media throughout the world were looking at the violence in Chicago with "horrified fascination". The point of his column was that too few people in the Chicago region living in neighborhoods beyond high poverty where most of the shootings are happening don't seem to care enough to get personally and emotionally involved in solving the problem. He concluded by writing "If blood on our streets doesn't bother us, maybe blood on our reputation will." I've spent the past 20 years trying to increase the number of people who would become strategically and personally involved in this issue. I believe in volunteer-based tutoring/mentoring programs because they can expand the network of adults and learning supporting kids in high poverty areas AND because many of the adults who become involved build a deeper empathy that causes them to grow into greater involvement. I know. That's how I grew from a once a week volunteer tutor in 1973 to someone who writes articles like this every few days. It did not happen over night. It's a process of constant engagement that transformed me over nearly 40 years. On September 13 I'm going to be participating in a SEA-Alliance event in Chicago titled Next Generation in Social Enterprise. It will be connected via a live video conferencing format with the Social Capital World Forum taking place in Sweden. I created this graphic yesterday to illustrate how the goals of this event are to connect people from around the world with each other in an effort that leads to new ways to solve social problems. I was contacted by one of the Chicago organizers a few weeks ago who did not know I existed until my name was found on the registration list for the Sept. 13 event. When it was recognized that I've been connecting on Facebook and Skype with the organizers of the Social Capital World Forum I was invited to give an introduction during the Sept. 13 event. When Neil Steinberg writes that 'Chicagoans are not paying attention' I can attest to that from my personal experiences. If you browse articles I've written showing work I've done in the past Decade you can see that I'm focused on bringing people together and connecting them to information that can be used to build youth support systems in every high poverty neighborhood. 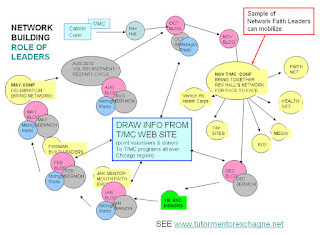 I've been trying to build support of business, philanthropic and political leaders in Chicago for the Tutor/Mentor Connection strategy for nearly 20 years. While I've connected with thousands of people and raised more than $6 million over 20 years to operate the Cabrini-Green Tutoring Program (1990-1992) and Cabrini Connections (1993-2011) and the Tutor/Mentor Connection (1993-2011) this has never been consistent money or more than pocket change in the third largest city in the country. Traffic to my network of web sites averages about 8500 visitors a month, but the number of leaders in Chicago who contact me each year to discuss ideas or provide their own support can be counted on one hand. If you search the words "tutor mentor" or "Chicago poverty map" at least one of my web sites can be found on the first page. Thus, if leaders were encouraging followers to research roles of tutor/mentor programs, this information would be available to them. That does not seem to be happening often enough. In my frustration I have been reminded of this section of writings from the Bible, under the topic of A Prophet Hath No Honour in His Own Country. Thus, I decided long ago that if I can't find enough support in Chicago perhaps I can find leaders in other cities and states who might want to dig deeper into the ideas shared on this blog and the Tutor/Mentor Institute, LLC site. Through the Internet I've stretched this outreach to the entire world. As a result I've had volunteers from India, Korea, Canada, Wisconsin, Kansas, Indiana and many other places take key roles in building the web platforms that I use to share ideas of how many leaders can work collectively to build expanded networks of support for youth living in poverty. My efforts are intended to fill the nodes on this talent map, and this village map, with names of people and organizations who share the same commitment that I share in this strategy map. Perhaps the attention Chicago violence is generating will increase the number of people in different parts of the world who look at the ideas I share and help me develop the Tutor/Mentor Institute Problem Solving Platform further. Or perhaps it will draw attention from leaders and partners in Chicago who are deeply concerned about our reputation in the world and the problems in Chicago.